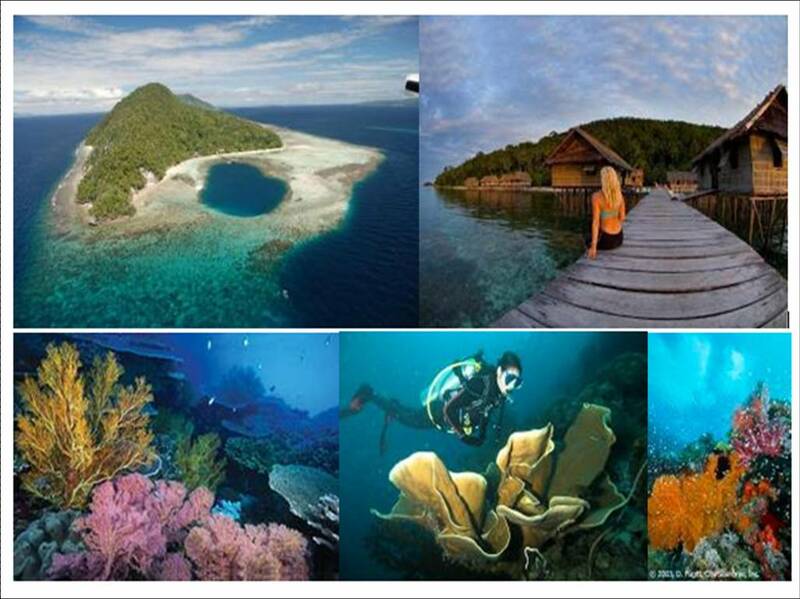 One more diving place that will make diver falling in love with the beauty of under water, Raja Ampat island. This island is located in Papua 50 mil from Jeftman Sorong harbour. You can reach this island by using speedboat and it takes 2 hours. This place was found by Holland people in 1990, Max Ammer. He built PT Papua Diving as that administer of this place. You can ask to this PT Papua Diving to pick you from Jeftman Sorong Harbour if you pay 200 Eoru. Or you can go there by rent speed boat with Rp 2 million. there are two place in this island which can be used for diving place. They are Kri Eco resort and Sorido gulf resort. Traditional building can be found in Kri Eco. These building were made from wood and bamboo. These building look suit with the environment. To spent night in this plant, tourist can use one of six buildings that available. In every building has four bedrooms for each room. And you will sleep well there. When you open your eyes after sleep for a night the first beauty that will you is bird warble. For your breakfast you can get java food. It is hear odd, as it is far a way from Java island but you can find Tempe Bacem( food made from peanut and it eat with chili dough). After you have breakfast you can start to get experience in this island by diving. You will find thousand of water plant and animal inside the water. This is predicted as the first place in the world that has most animal and water plant in it’s water. You can visit one object that also offers you the beauty, Kri Eko Bridge. There are many colorful fishes aroud sea roch under the bridge. This place also can be used for snorkeling.